This can be a very tough task. If you are tired of seeing your child’s bedroom a mess, you may want to take some of these tips for organizing it. 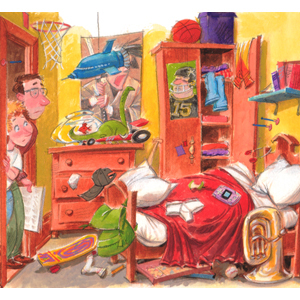 Kids play a lot and they are usually not concerned with the way their rooms look. This is completely normal, but it is also frustrating for parents. One great way to organize a kid’s room is to deep clean it. As you do this, you must get rid of things. If you have to do this while the child is gone, that is fine. That is what I have to do sometimes, otherwise nothing will get thrown away. You can throw things away or donate them to a charity. As you are deep cleaning, have some storage containers available. Buy ones that will slide under the child’s bed, or that can be stacked in the child’s closet. Use these containers to organize the child’s toys and items. One of my daughters liked to make craft items a lot and I always made her keep her supplies in a huge tub. This tub fit under her bed and it helped her keep her room clean. Force your children to help with the cleaning. Most young kids are not capable of really cleaning their rooms. They might be able to shove things under the bed or in the dresser, but the room will not be clean. On the other hand, some parents do all of the cleaning. I am suggesting that you do it together. Teach your child how to clean and how to organize his or her things.